Mother Melva Rita Franklin Legacy Will Live On! Teach! Read! Tell It! As we build and recreate community and embody the lessons and spirit of our Esteemed Tireless Elder Warrior Mother Melva Franklin we must also be unrelenting. She embodied a scholarship that connected to community that moved and lived. It was a part of her daily life. For all you who did not know Mother Franklin, I would like to share some thoughts with you. The Ghana Nkwanta Project has also started a blog for Mother Franklin for those that knew her to share their thoughts. We want to share the beauty and spirit of our Beloved Elder Mother Franklin who was so active and instrumental in our community. She could be out all day and all night going to meetings and forums seven days a week. 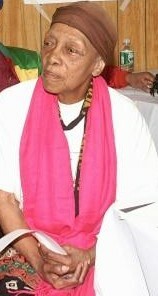 She was active with the United African Movement, National Action Network, Ghana Nkwant Project, The Harlem Knitting Circle, a member of ASCAC, took stretch classes at the National Action Network, and was a member of the Council of Elders for African Union for the Diaspora 6th Region. She is a history book and she was always ready to learn. She was always carrying a big bag full of books to read and was a tireless champion of knowledge in the tradition of George Washington Carver, Booker T. Washington, Marcus Garvey and Malcolm X. Let us be our own Masters in Thought and Care about ourselves as we move forward in a united accord, moving and finding Common Ground, as we build and sustain ourselves and our communities into the 21st Century. This is our Elder Franklin’s advocacy and legacy. She died at the age of 95 and was born in West Columbia (Sugartown), S.C. on February 26, 1912. Sugartown which was the name give to several Cherokee towns. In Cherokee, the name was Kulsetsiyi, meaning "honey-locust place" from "kulsetsi" (honey-locust) and "yi" (locative). The word "kulsetsi" came to be used for "sugar" as well, thus these towns were often referred to as "Sugartown" by the English colonists. Carlos Cooks stated that "The culture of a people is best manifested by the homage they pay to those who led with dedication and devotion to freedom and cause." Mother Franklin stood a giant among men and champion for our CAUSE.